Shop Zoom MS70CDR MultiStomp Guitar Multieffects Pedal from AMS with 0% Interest Payment Plans and Free Shipping. 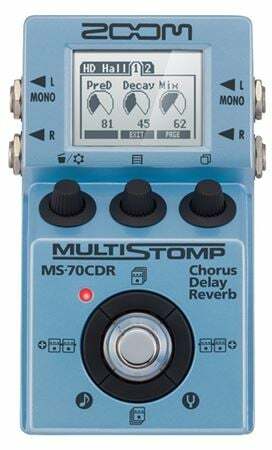 Zoom's MS-70CDR MultiStomp pedal features chorus, delay and reverb effects. It provides the full power of a rack-mounted multi-effects device in a compact stompbox design. With its 86 custom guitar and bass effects, an easy-to-use interface, onboard chromatic tuner and versatile power options, you'll be astonished at how much this little box offers. Zoom’s unique Tail function allows delay or reverb effects to fade away naturally, even through the next played phrase. For example, after playing a solo using a delay effect, even if you switch to a rhythm tone without delay, you'll continue to hear the sound of the solo delay fading away. Zoom’s cutting-edge ZFX-IV DSP microchip uses 32-bit floating-point calculations, giving it the ability to create sophisticated studio-quality effects such as rich, dense reverbs and realistic spatial simulations. The MS-70CDR allows you to create and store up to 50 of your original patches. There are also 40 preprogrammed patches which form a versatile collection that includes some of the most popular guitar stompbox sounds, as well as effects personally designed by some of the world's top musicians. Bought to use on church acoustic guitar. Didn’t want to drag a pedalboard back and forth to church. Wanted a little chorus, reverb and slapback and this did it. Wanted fullness in my guitar sound. Will use on my Les Paul also when I don’t want to haul a pedalboard around. A lot easer to set then my old Digitech. I love all the effects all at my finger tips and the option to change one instantly. 100 per cent great I'd buy another. Finally a digital multi-effects that doesn’t get bogged down with amp models you don’t want and overdrives that sound bad. Digital modulations like chrous and ambient effects like delay and reverb on the other hand sound pretty good and can achieve some unique textures. The Zoom ms70 has plenty of these effects to choose from; some good, some not so, most decent. Because the asking price makes it such good value there’s nothing to really to complain about. Yet, there are some interface designs I’d like to see improved. While presets are programmable to be activated by the stomp they only follow a strict sequence. So when I want to use a particular preset I assign it for the first in sequence, but if I want to turn that preset of what I have to do is assign a blank present next in the sequence. Then if I want it back on I reassign the preset as the third in sequence. A second stomp button could easily fix this. Really I would love this pedal to be laid out like the G3n. I've tried a ton of different reverb pedals and the verbs in this pedal are as bit as good as it's competition in its price range. On top of that you get a lot of cool modulation effects. Also a big plus in my book is that it will automatically save your settings for whatever effects you are using so when you turn it on again it will be where left it like a regular pedal. Deep, Rich Delay & Reverb Effects! This is an amazing Reverb/Delay stompbox! TONS of choices and preset options . . . all in the space of just one, normal effects peddle! However, the thing that most impresses me is just how deep, rich, and CLEAN these effects sound. Matter of fact, this peddle is SO quiet and full of sonic heaven that I actually use it in my acoustic/electric guitar (Taylor 810 CE) set up and it sounds FANTASTIC! Learning to navigate and build your own presets can be a bit of a challenge . . . at first. But once you get it figured out, you'll love this thing! I only wish this pedal had one more feature . . . an expression pedal input. If it had that, this product would've been rated a perfect '5'! Still the quality and richness of sounds you can get out of this box are EXCELLENT! 'Nuf said. A wide selection of chorus, reverb and delay effects including models of some first rate pedals. Perfect for your amps send/return loop, as these types of effects sound more realistic after the preamp stage rather than between guitar and amp. I also have a Zoom G3 v2 that I like a lot. Been waiting on this one forever! Only takes one space on my pedalboard and does almost any affect you want WELL. Easy to tweak on the fly without going thru a bunch on digital menus. It can be set as a standalone pedal that can be just turned on & off with the footswitch but I keep mine set to scroll thru about 5 patches that I've preset to my liking. I leave one patch set for "line through" for a dry sound. I tried a line 6 M9 but it cut the signal. Obvious volume loss to my ears. Maybe i just got a dud but i sent it back. This thing is perfect for what i needed. I use effects pretty sparingly but its very capable of doing deep & saturated also. I've got prob a dozen or so presets that I've stored and named so if i want to change things up one night i can just ad or subtract them from the patches that the footswitch scrolls thru with a couple simple adjustments. So easy i can do it in the middle of a song if need be. Got alot of cool old pedals just collecting dust now. Love it! !